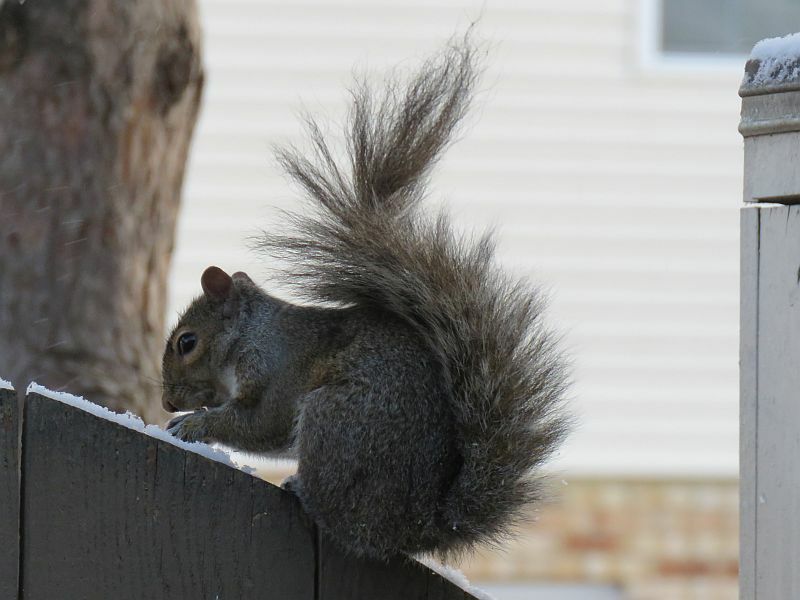 Another year, another ‘what I saw on my patio’ report…number 8, to be exact! 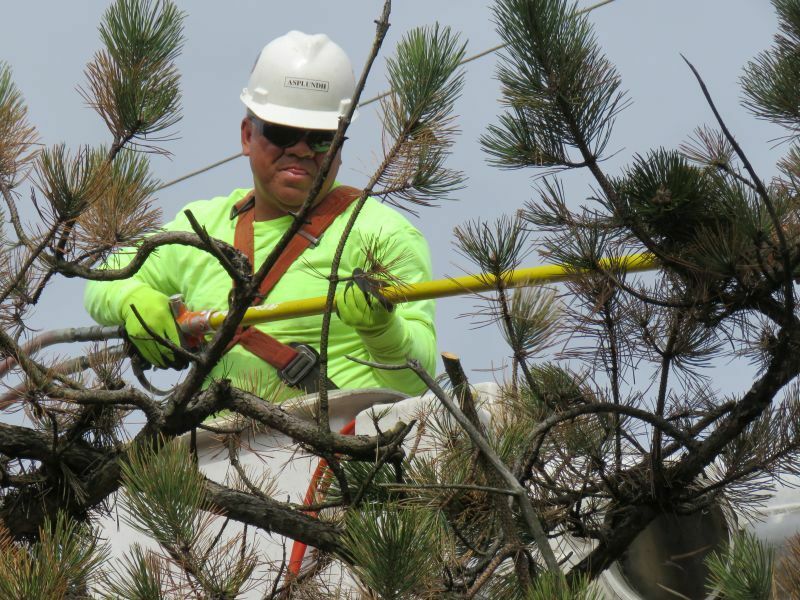 Previous yearly reports can be found here: 2011, 2012, 2013, 2014, 2015, 2016, 2017. A small place, but a lot happens there in a year. …and I mean let things go! 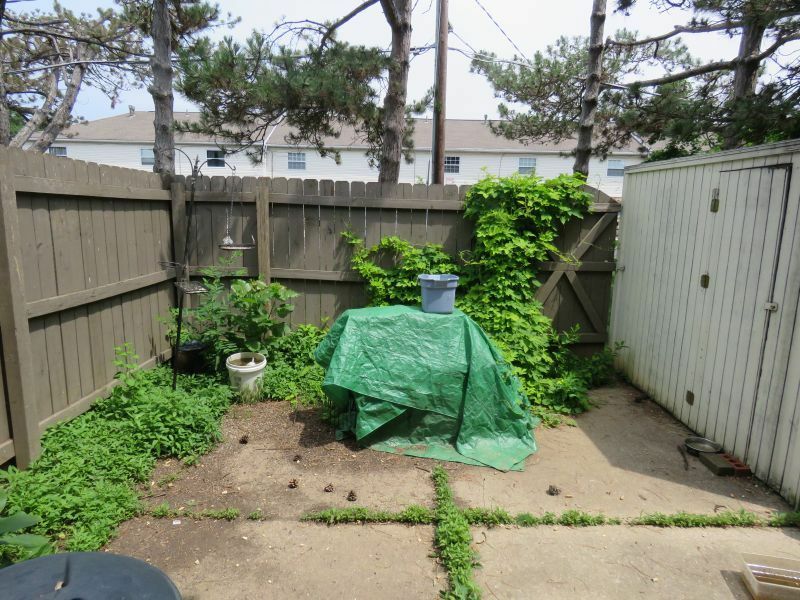 The male Wild Grape vine is well-established along the back fence. 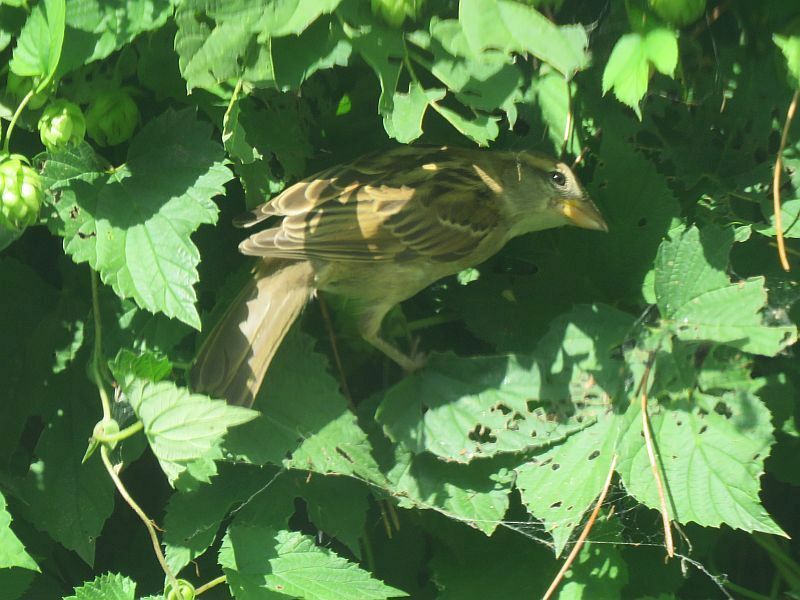 Lots of things use the Grape Vine for cover, like this House Sparrow hiding from a Hawk. 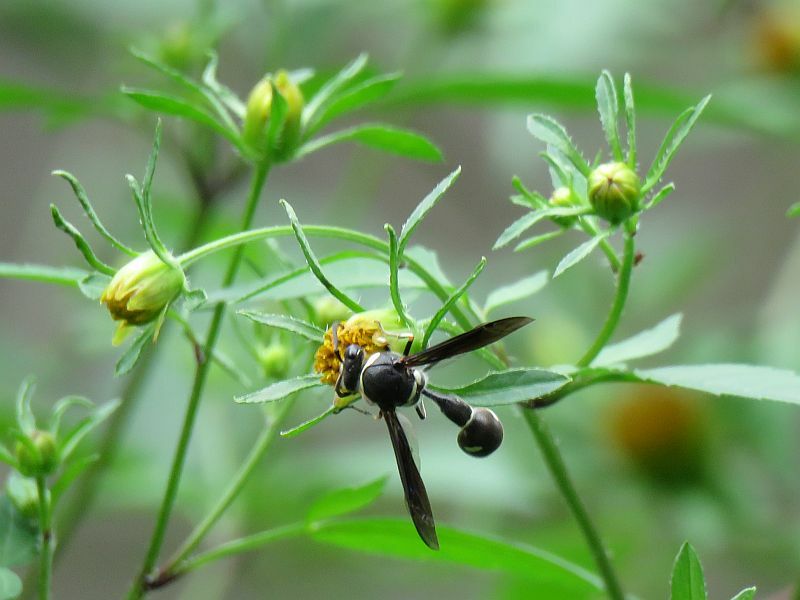 Wildflowers were less abundant this year- late summer and autumn saw the return of Lady’s Thumb (also known as Knotweed), and autumn also brought Tickseed Sunflower (that’s a wasp pollinating the flower). I wonder at the variation of plants from year to year; perhaps it depends on what’s in the droppings birds deposit in the soil. 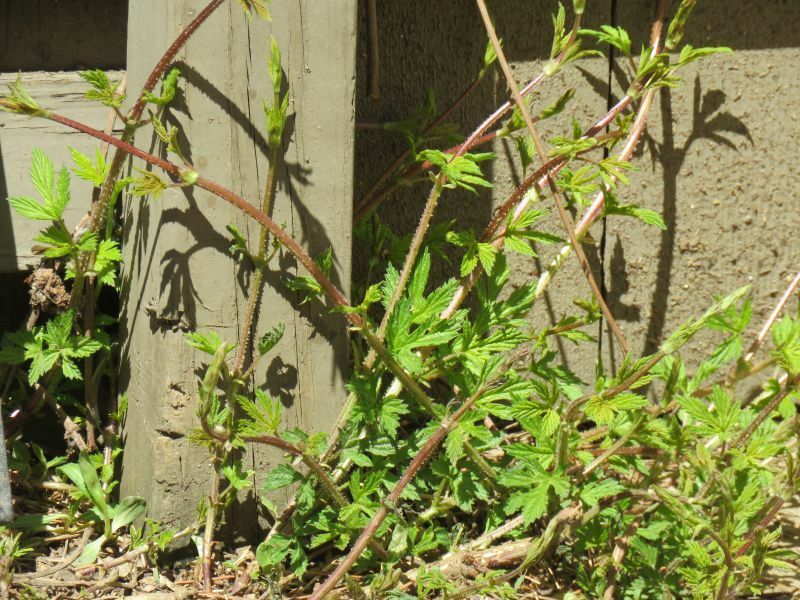 There also were a few Indian Hemp plants blooming, and a couple of Cottonwood saplings struggled to grow in a corner. And now, onto the birds. As usual, I had a Robin claim my patio as his territory in mid-late winter. 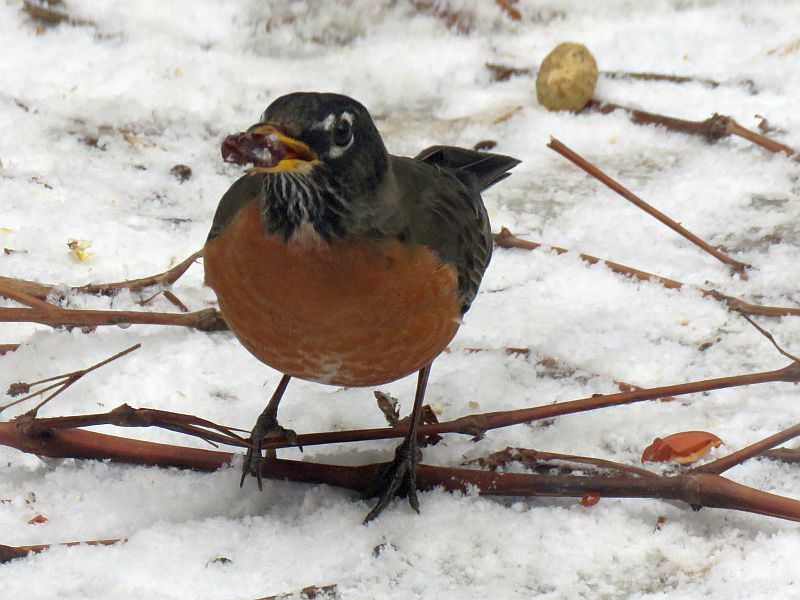 He liked eating raisins and chasing off other Robins. 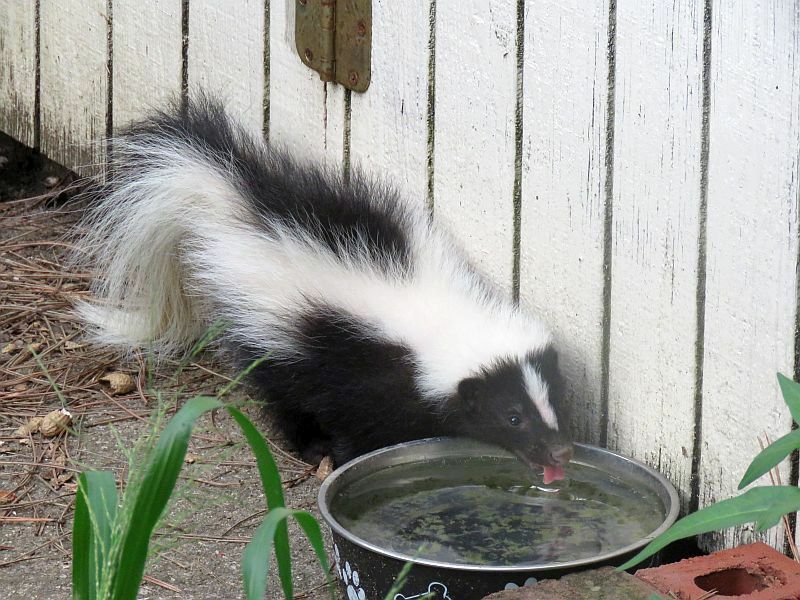 Once it was spring, he was off raising a family and visited no more- easy to find bugs to eat by then. 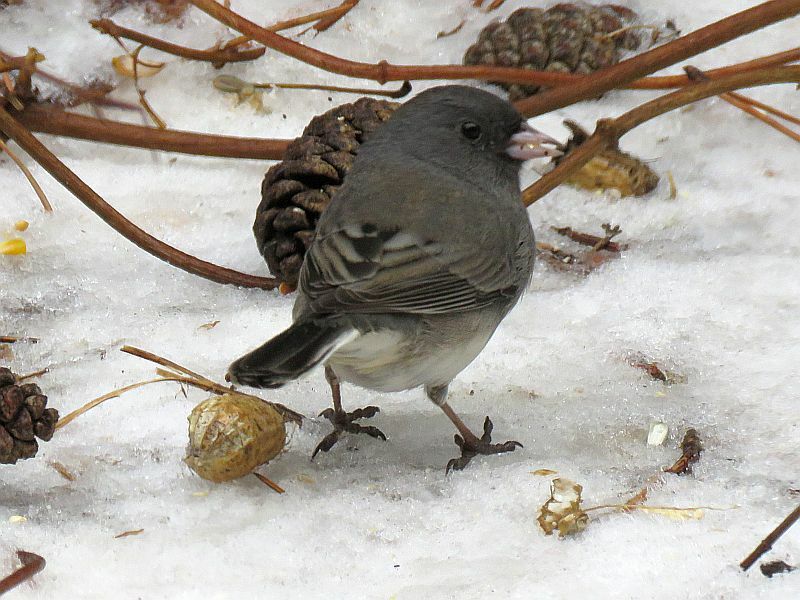 The early winter months also saw the usual small flock of Dark-Eyed Juncoes hanging about. 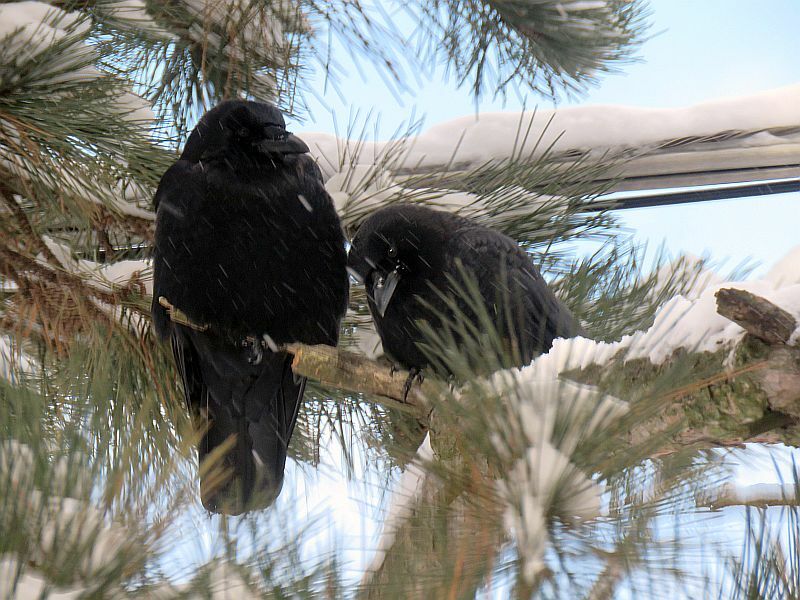 They like the patch of evergreen trees next to the patio (like several other types of birds). They left in the spring to head north to raise families. 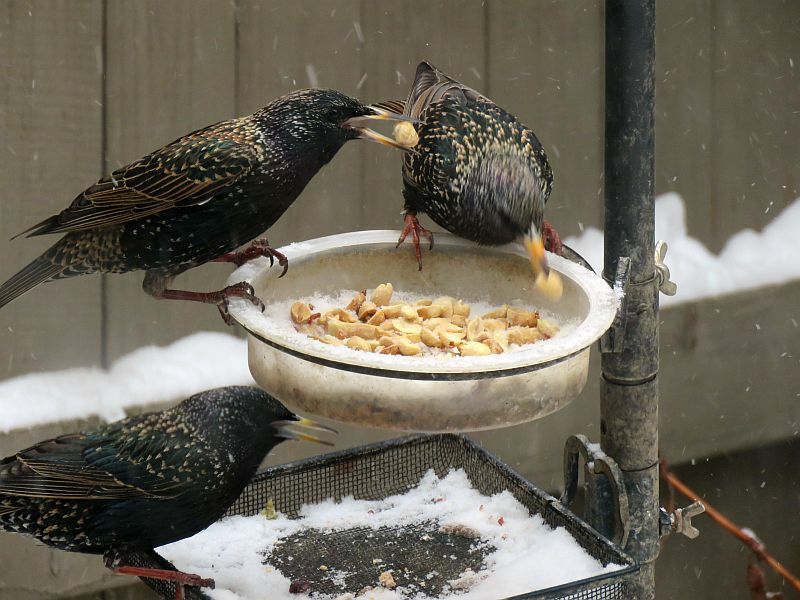 Starlings visit my feeder far more often in the cold weather. 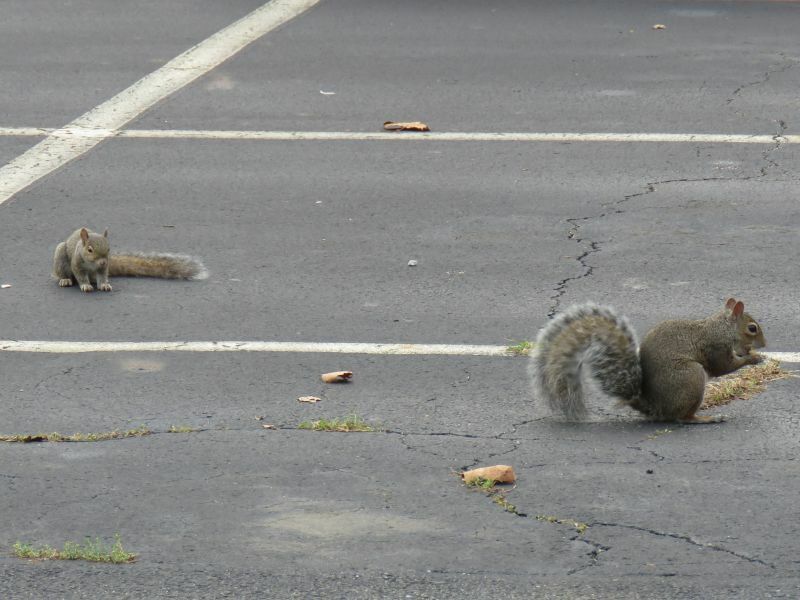 They can empty out a peanut bowl pretty fast when they bring their buddies. Moving onto Hawks- there were three individuals I saw from the patio, this is an adult Cooper’s Hawk who likes to come by looking for bird or animal snacks. 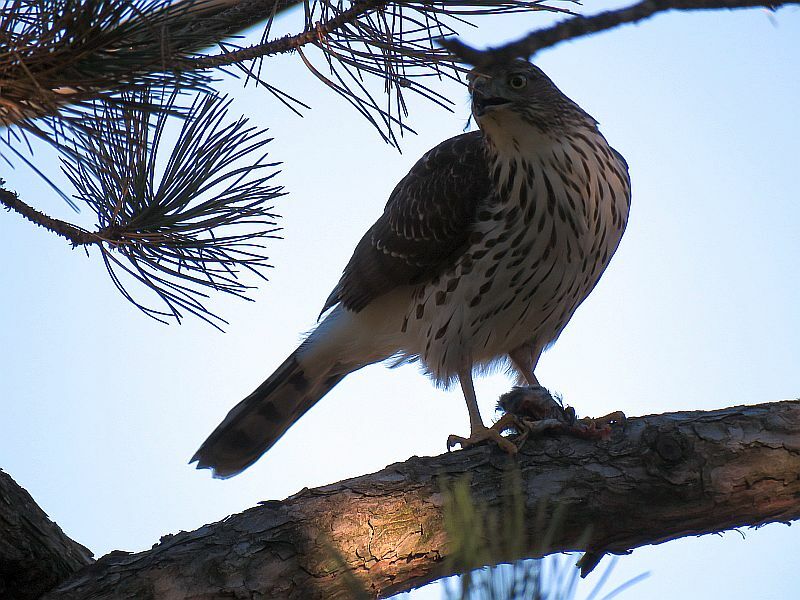 Here’s an immature Cooper’s Hawk (probably offspring of the aforementioned adult) eating a snack in an evergreen above the patio. 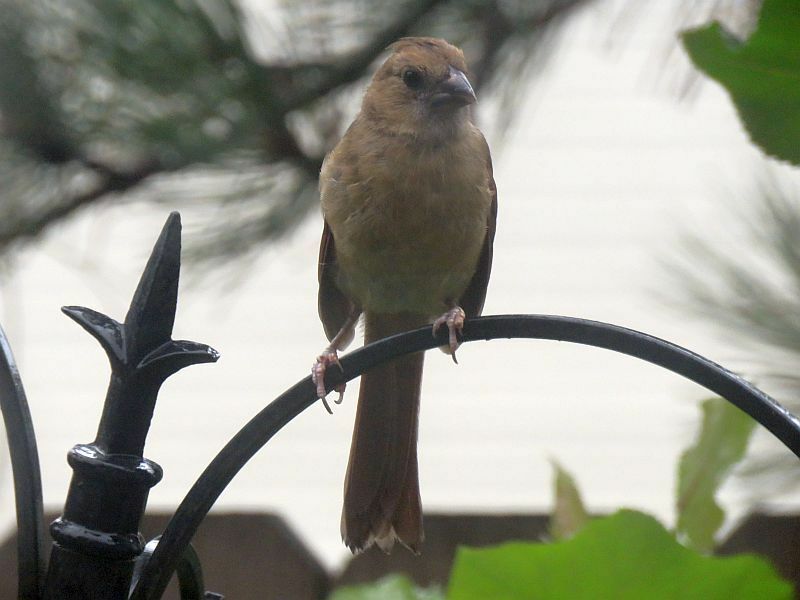 Note the differences in the appearance of the breast (adult with fine red bars, immature with thick brown streaks). 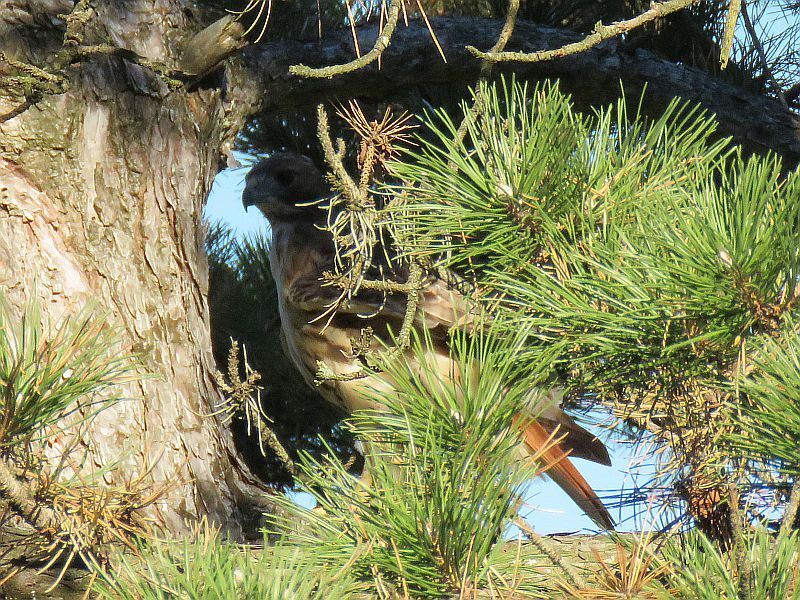 Here’s the local Red-Tailed Hawk in a nearby evergreen, either looking for snacks or trying to hide from hectoring crows. 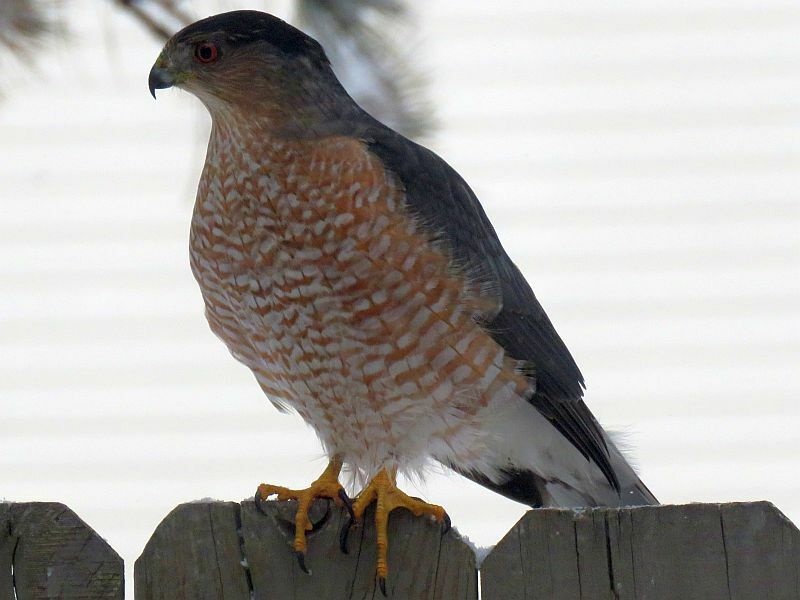 These hawks are more often seen soaring above, while the Cooper’s fly low and fast through suburbia bringing shock and awe to nervous critters below. Onto another large bird- the Crows. 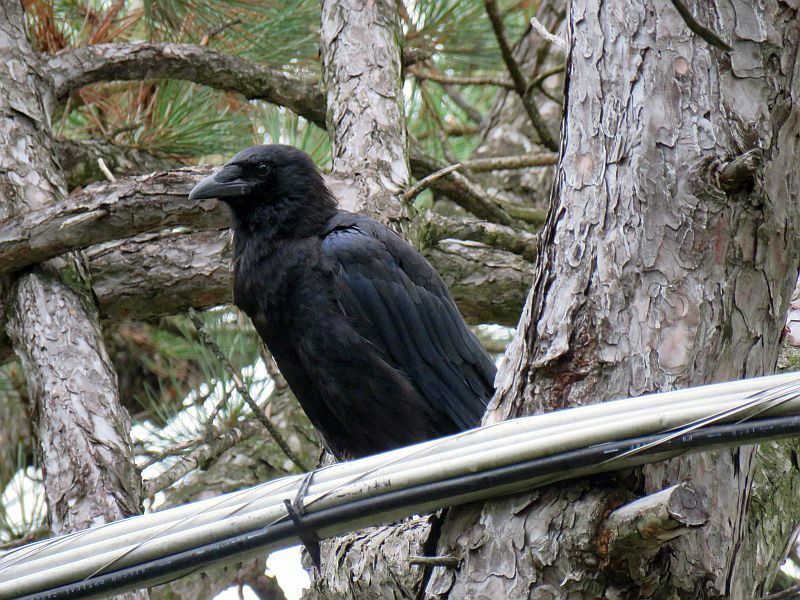 Year after year, the same Crow family visits for peanuts. I enjoy watching these intelligent birds. The weather isn’t always great, but that’s Ohio for you! There seemed to be an issue with a certain crow this year. A Crow would crowd out another, pushing it away from others. Either it was a visitor from outside the extended family, or it was an extended family member- a 2-or-3-year-old that the core family decided it was time for them to strike out and start a family of their own. 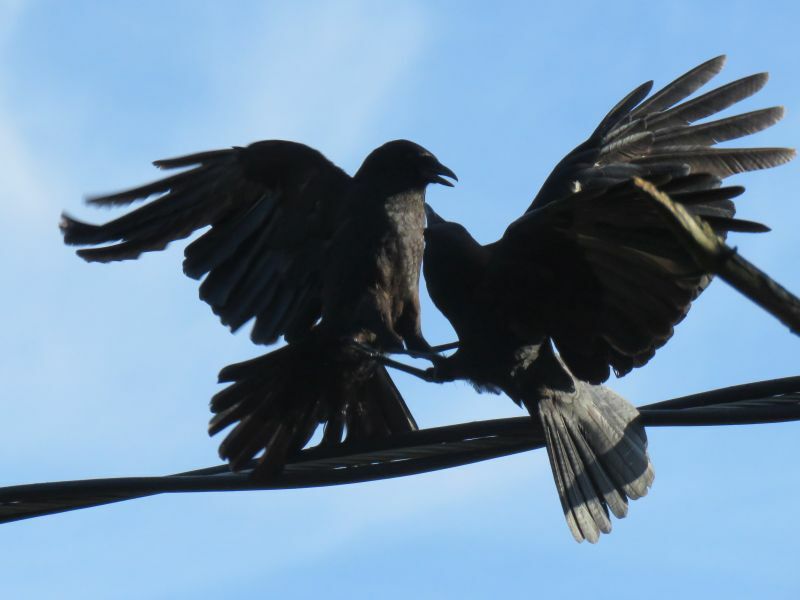 Younger Crows will often stay and help their parents raise young next year. Here’s a juvenile Crow begging from a family member in summer. You can tell the juvies by their red mouths that are often open. They usually show up in June or July. Onto the Woodpeckers. Woodpeckers are drawn in to the feeder occasionally because they see other birds there from the patch of evergreen trees right above. 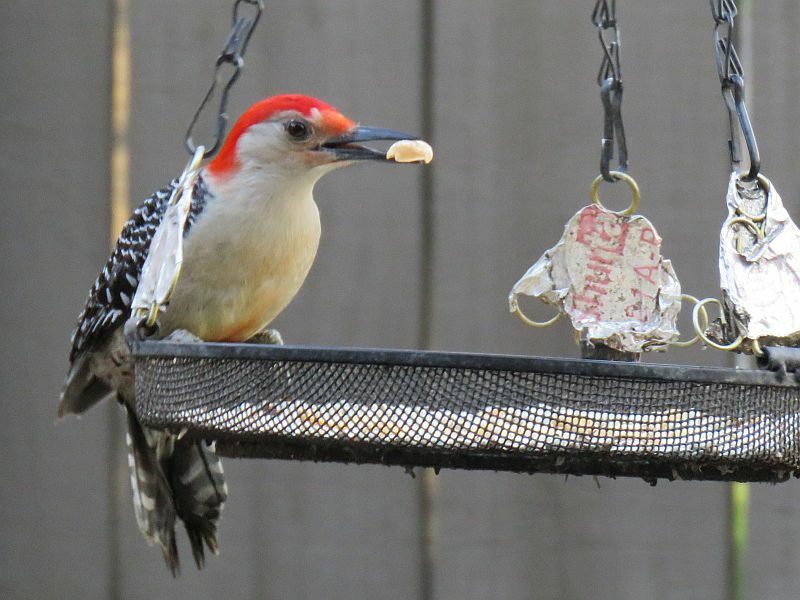 Here’s the local male Red-Bellied Woodpecker grabbing a peanut. It’s a beautiful large bird. 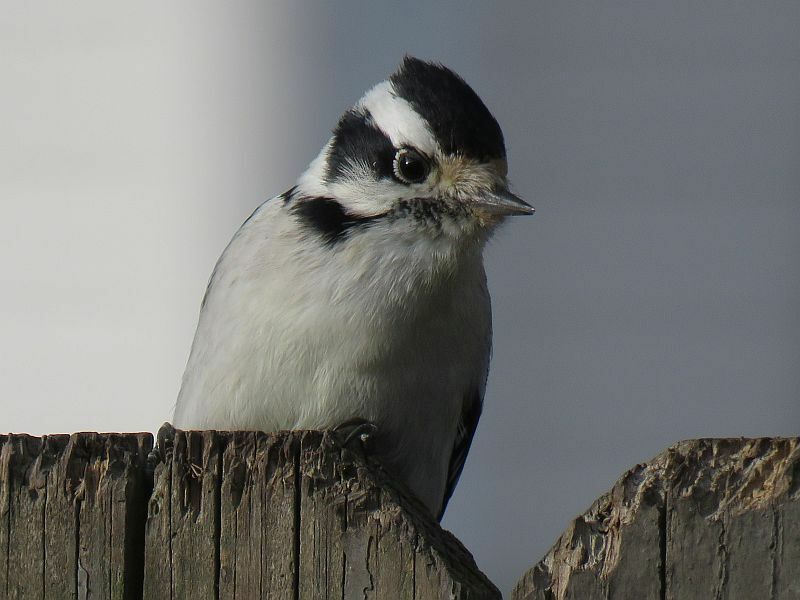 The other Woodpecker I occasionally see at the feeder is this female Downy Woodpecker. She’s shy, often watching what’s going on from the fence. Downies are the smallest Woodpecker in Ohio. Although not a Woodpecker, White-Breasted Nuthatches behave like them, walking vertically up and down tree trunks, usually feeding off of insects and their eggs found in tree bark crevices. You can see the upward angle of the beak that it uses as a probe to find food. There’s a pair of these birds that fairly regularly come to my feeder. 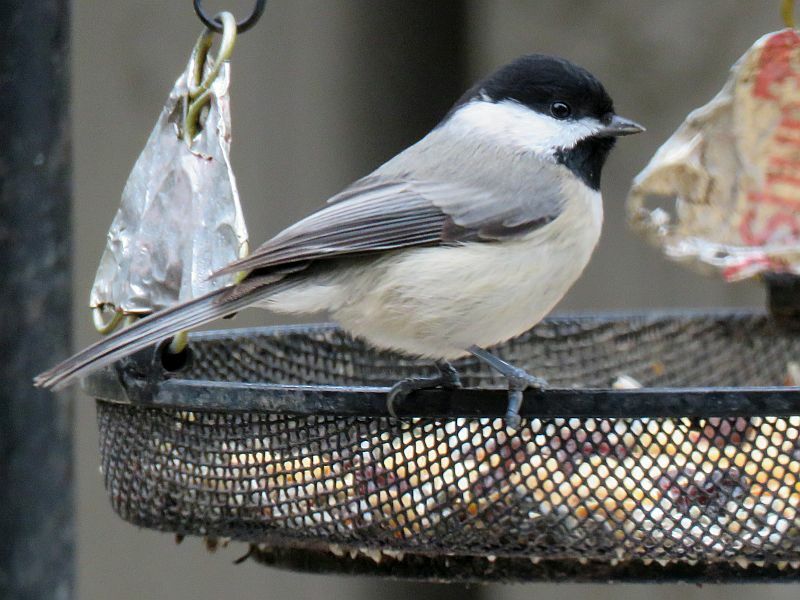 Here’s a common feeder visitor, a Carolina Chickadee. I have 3 or 4 of them that come around, possibly an extended family. You’ll see younger ones show up with their parents in the later summer. They are pleasant birds, always making their little calls, that love to stash safflower seeds in bark crevices. This is known as caching. 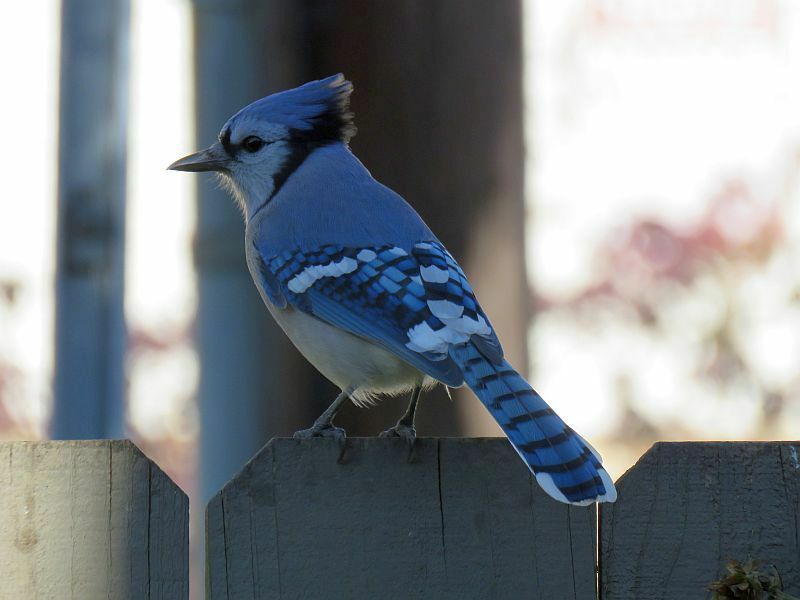 Here’s another stasher- a Blue Jay. 4 of them visit my feeder from the north and often carry peanuts back the way they came. 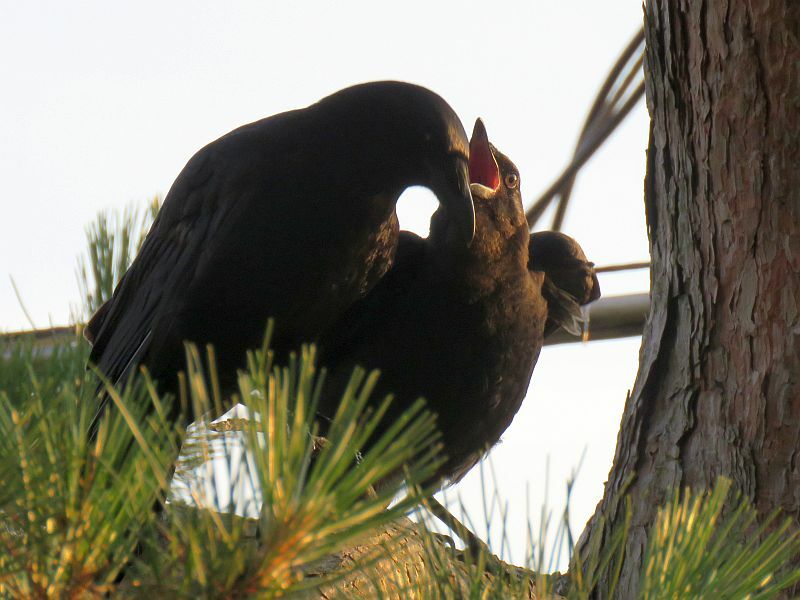 These loud brash birds are related to Crows and are intelligent like them. 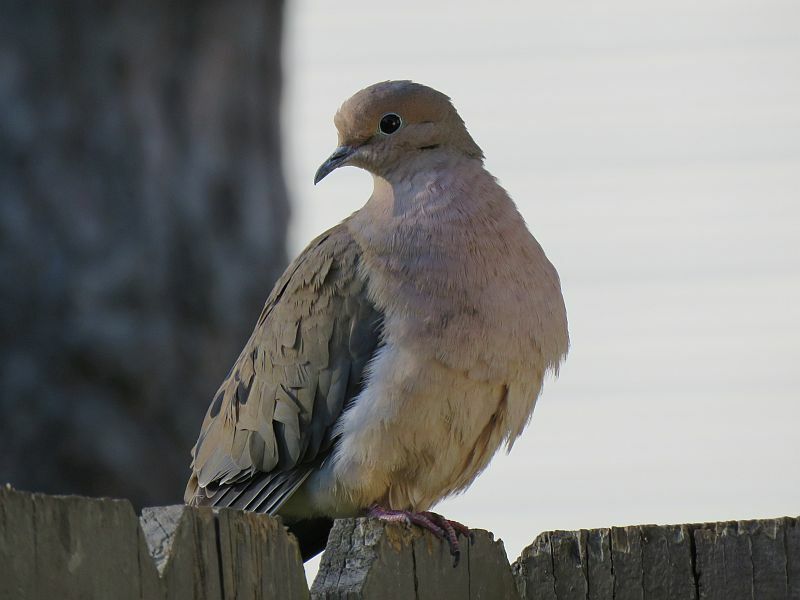 Sticking with larger birds, Mourning Doves are daily visitors to the patio, enjoying safflower seed in particular. Evidently, word has gotten out about the goodies to be found here. 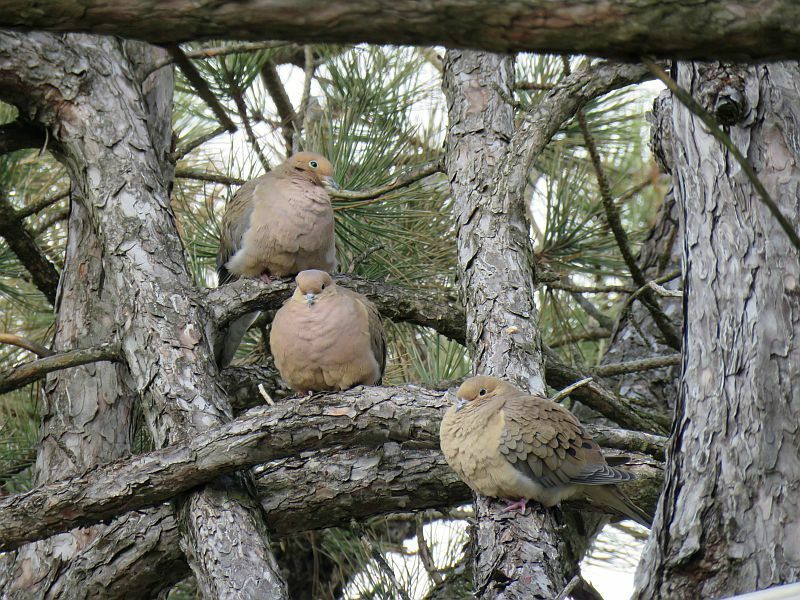 I’ve seen up to 14 Mourning Doves on the patio at once. Last year saw an increase in their numbers here. 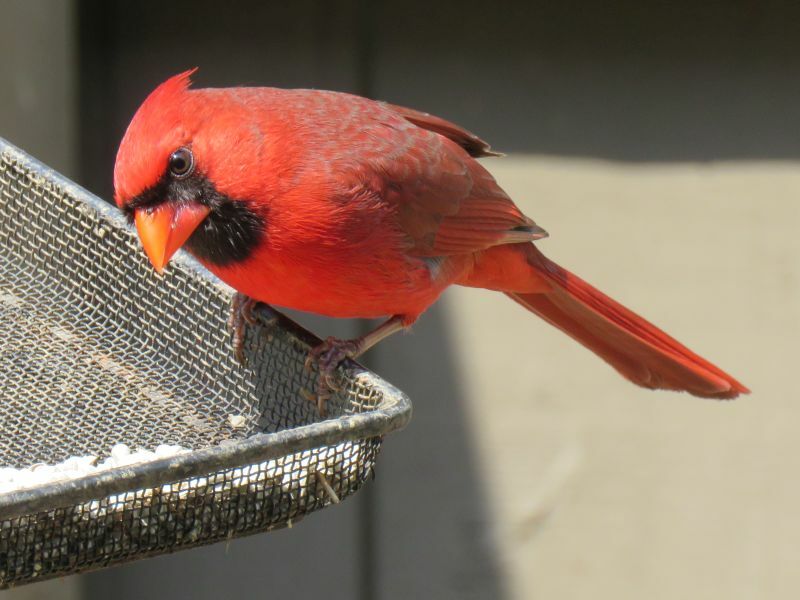 Ohio’s state bird, the Northern Cardinal. 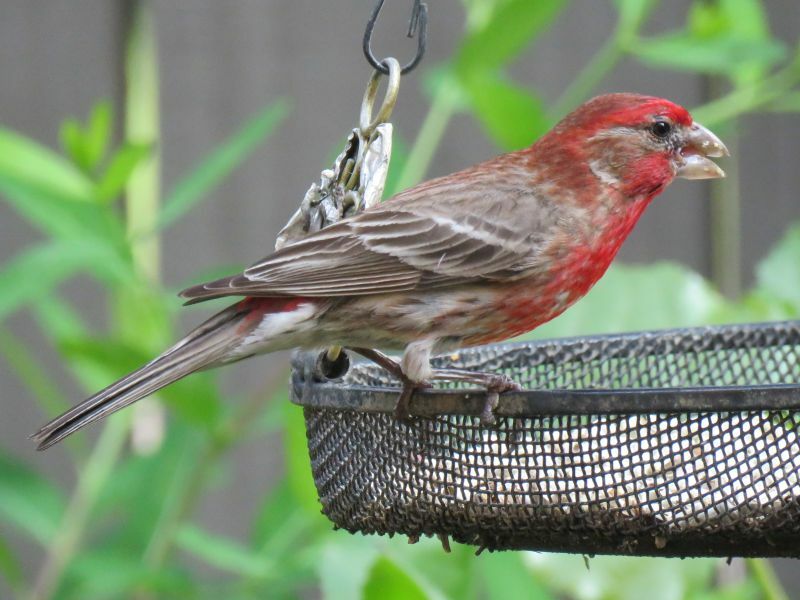 A pair regularly visits the feeder, particularly early in the morning and late in the evening. I’ve seen another male (or another pair) slip in occasionally. 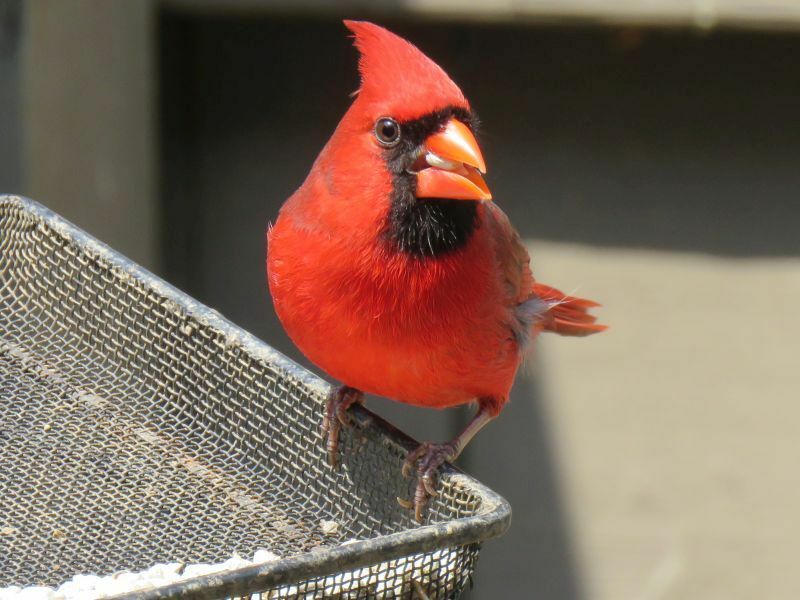 This is an immature Cardinal. Often secretive, immatures are characterized by their dark beaks. 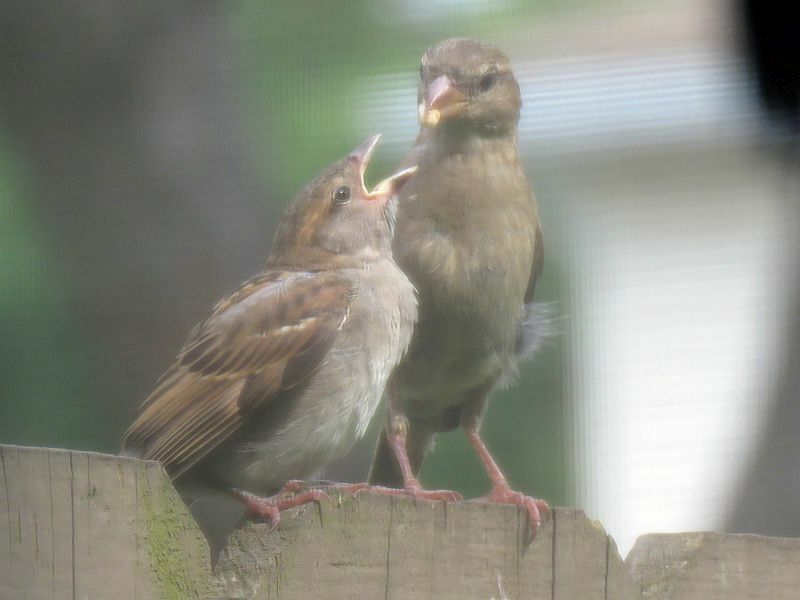 There were 2 young birds that the local pair brought to the feeder once they were old enough. Moving on to Sparrows. 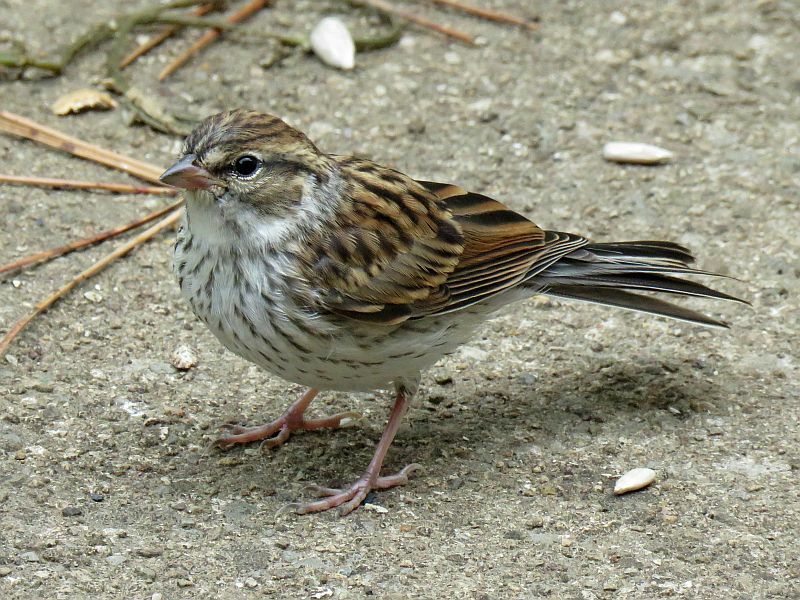 We’ve seen the Dark -Eyed Junco already; here is a Song Sparrow. There is a local pair that come visit my patio. They are shy birds that avoid crowds. 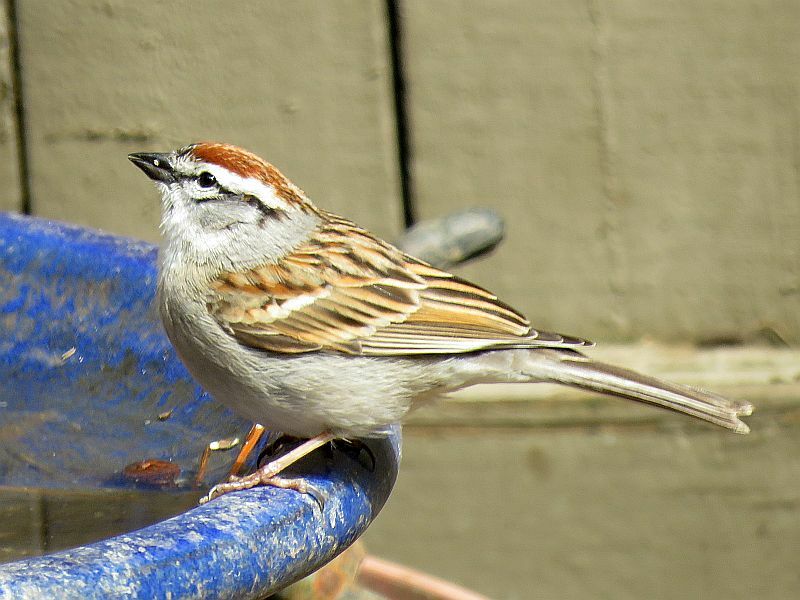 This is a Chipping Sparrow- a handsome friendly bird that is here in the warm weather to raise a family, then gather in flocks in September in anticipation of migrating south. I’ll see 1 or 2 pairs in the warm weather. 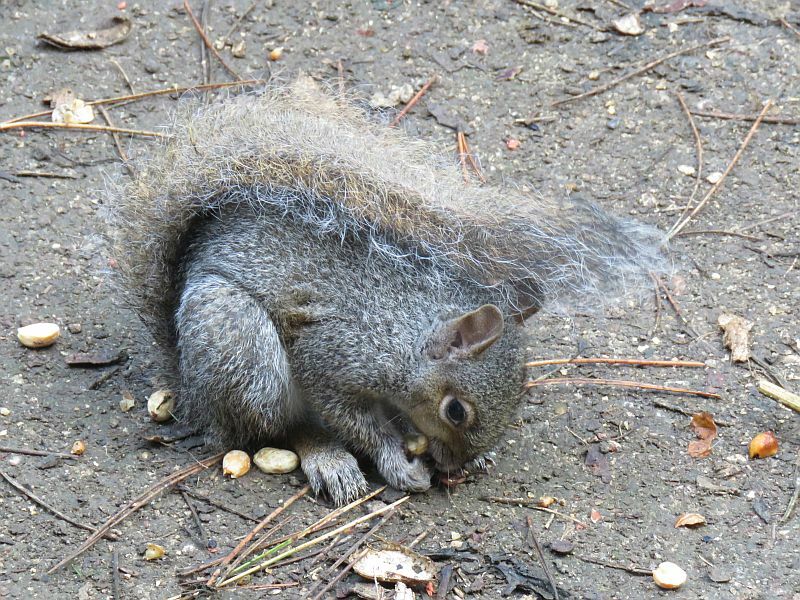 They’ll often plop right down upon the ground in front of me from a tree above while I’m distributing food. 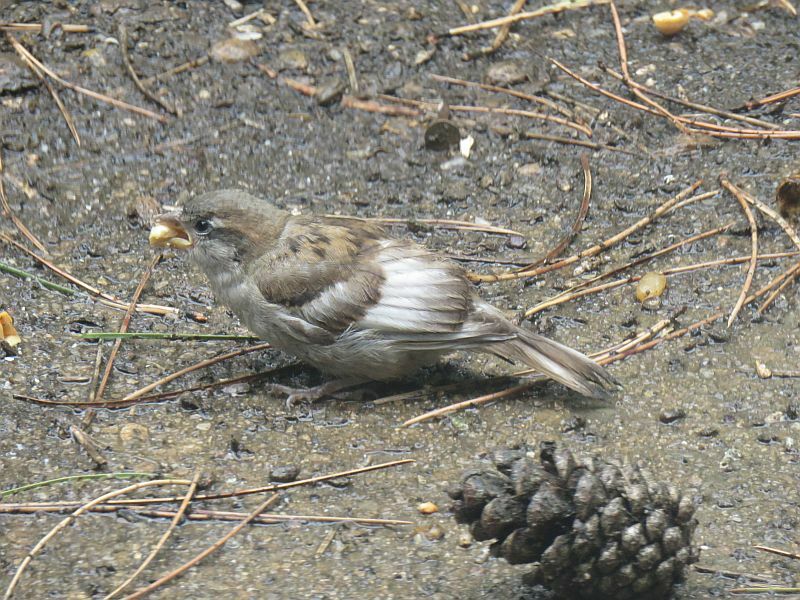 Here’s an immature Chipping Sparrow that followed a parent onto the patio. It’s fun watching young birds figuring out what’s good to eat and what’s not. 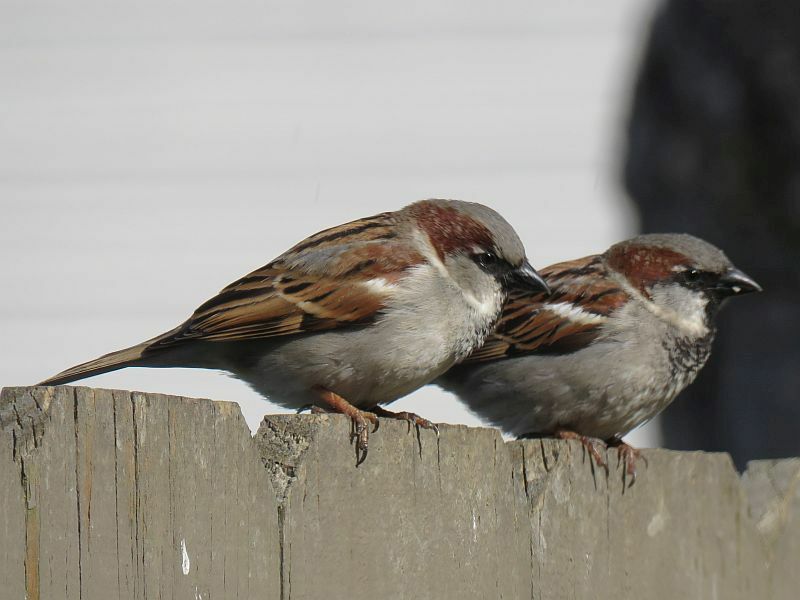 These are male and female House Sparrows. 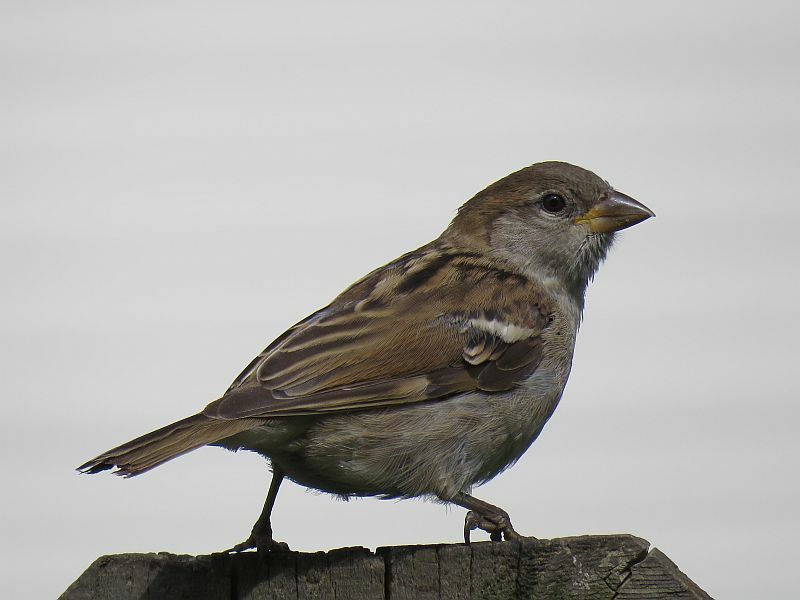 Technically they are old world Finches (having been brought over form Europe), but we call them Sparrows anyway. There is a flock of 2-3 dozen in my apartment court, and they often come sweeping in for food in a good-sized group, snatching food from under each other’s beaks and in general being raucous. They sweep on out as one as swiftly as they arrived, being well-tuned to anything out of the ordinary, like Hawks (or an abundance of false alarms). 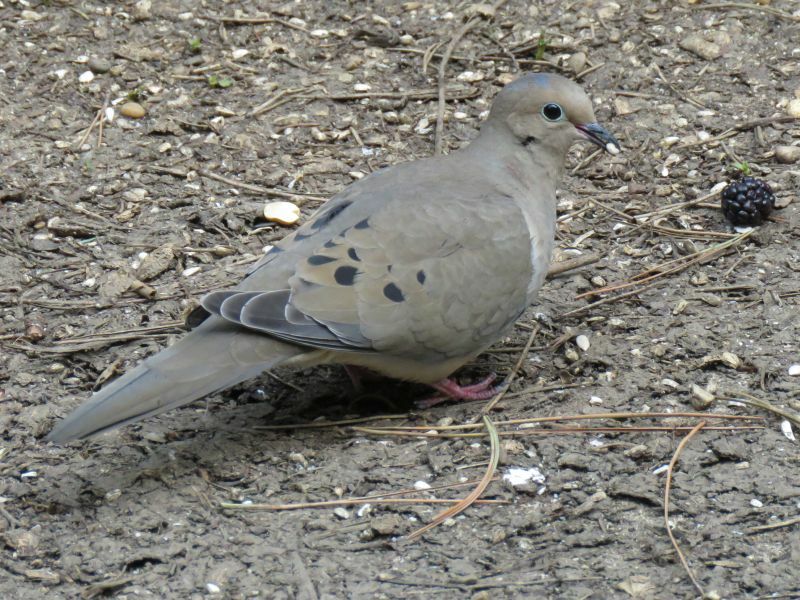 This young female has a big patch of white feathers on her wings. I’m not sure if this is partial leucism or not. 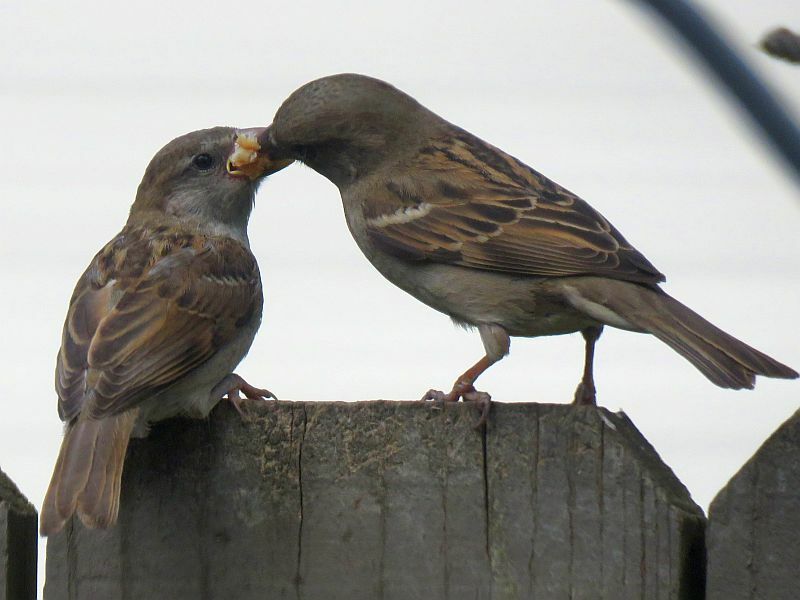 It’s fun watching the juvenile House Sparrows being fed by their parents. They wiggle their wings and gape open their mouths- feed me! Speaking of Finches, there is a healthy local population of House Finches that nest on the apartment complex. 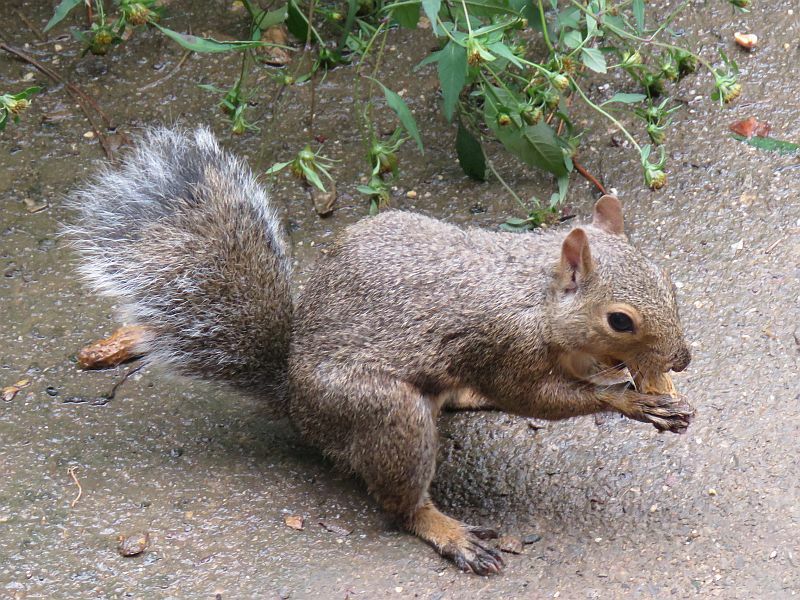 They occasionally come by for some coveted safflower seeds. 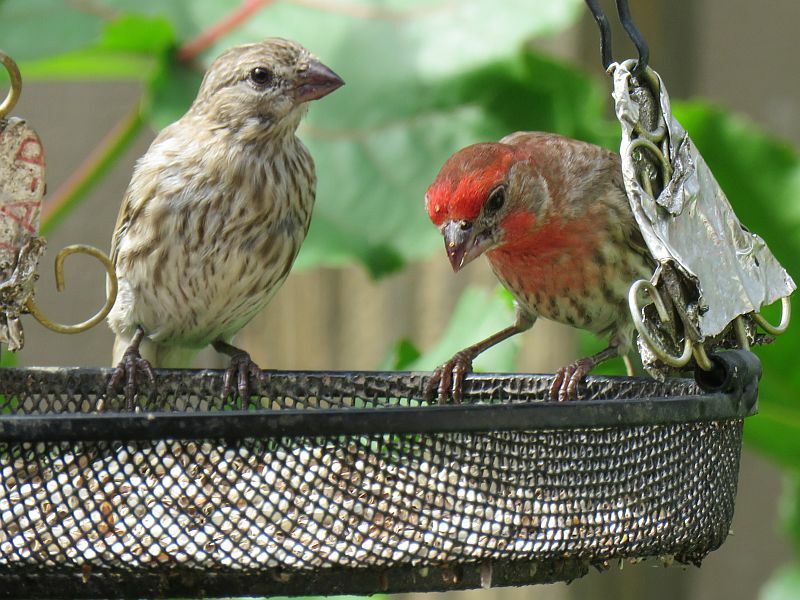 Native to the far West, eastern House Finches escaped from captivity in New York City and spread over the eastern half of the country. 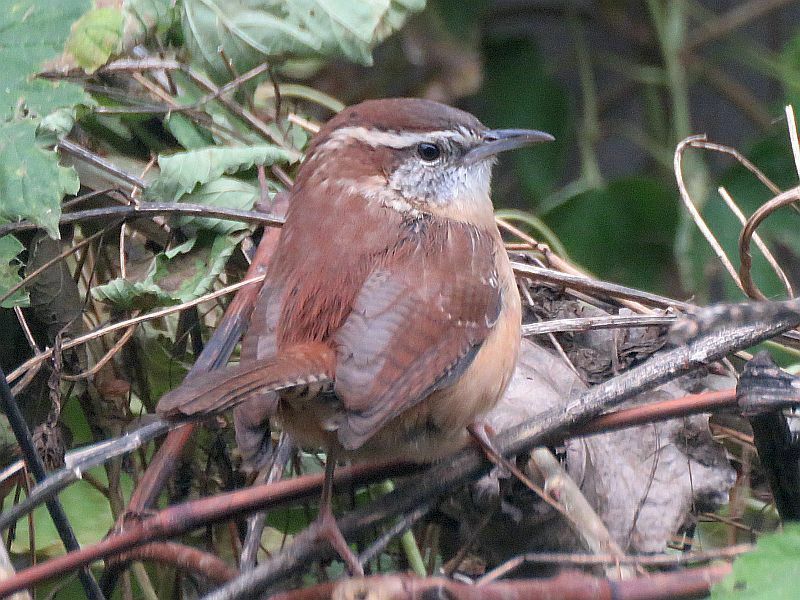 This Carolina Wren is visiting more and more often in winter. 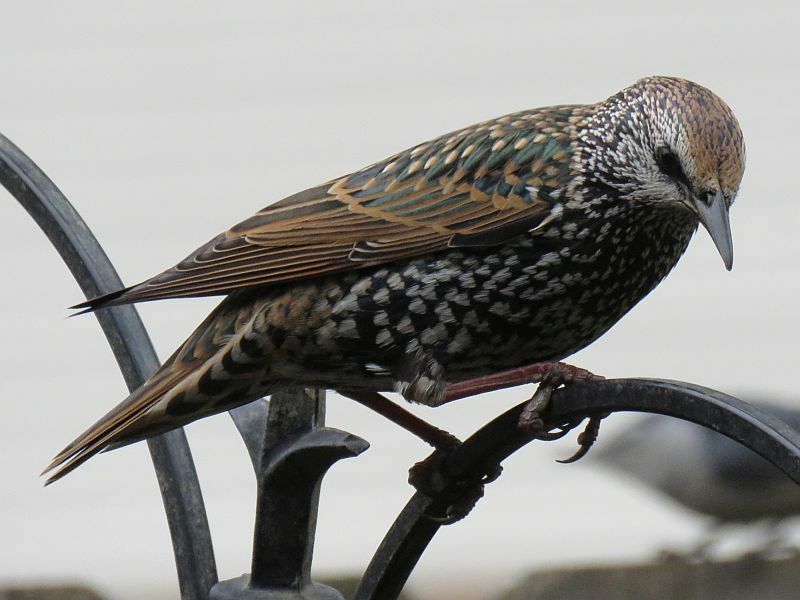 A small bird with a loud voice, it creeps into all sorts of nooks and crannies as it explores the patio. It brought its mate along once. 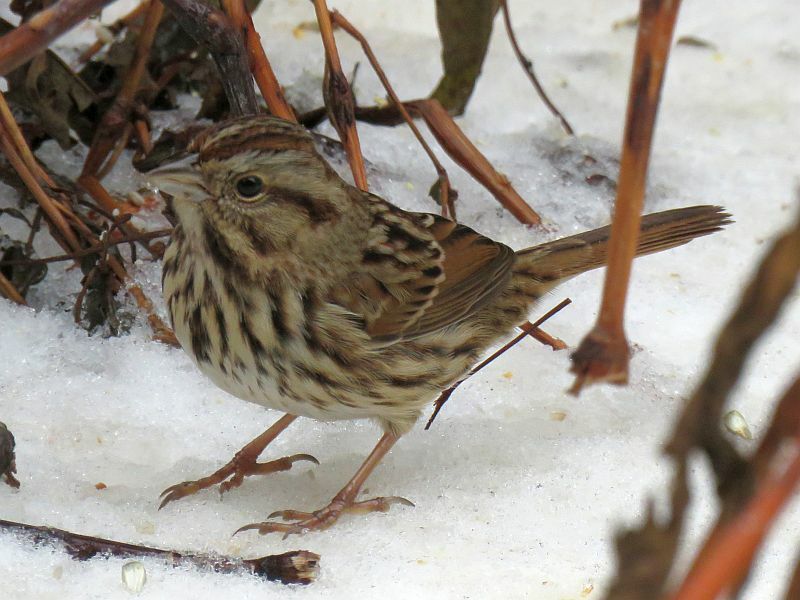 These hardy birds stay year-round in Ohio. 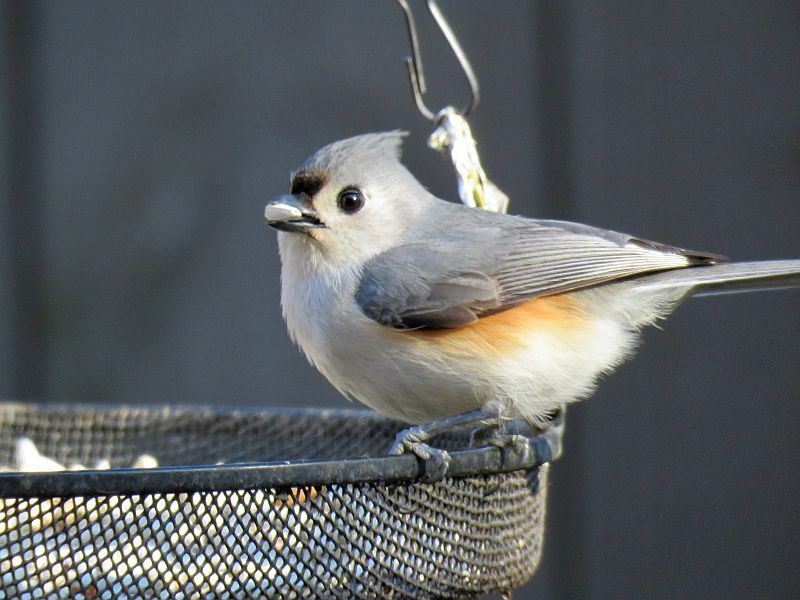 This Tufted Titmouse is a rare feeder visitor, though I see them often enough in the ‘wild’. They look like miniature gray and white Cardinals. Another rare visitor was an American Goldfinch (no good photo, alas). And now, onto the mammals! 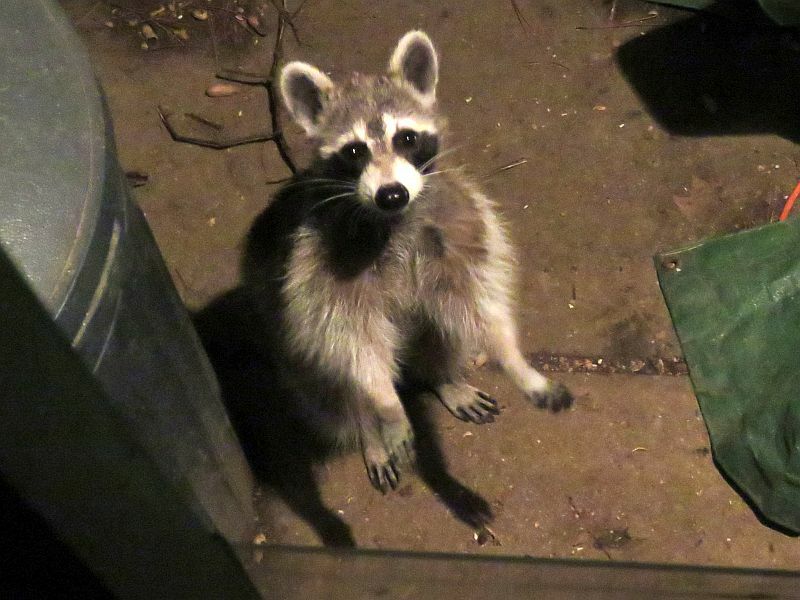 The occasional Raccoon visits at night. 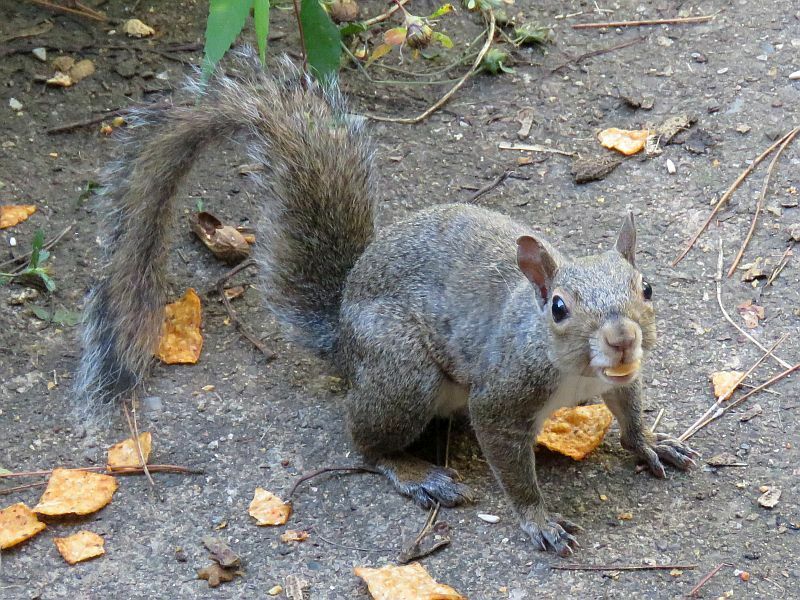 They are curious creatures and love peanuts. One is shy, another bold. 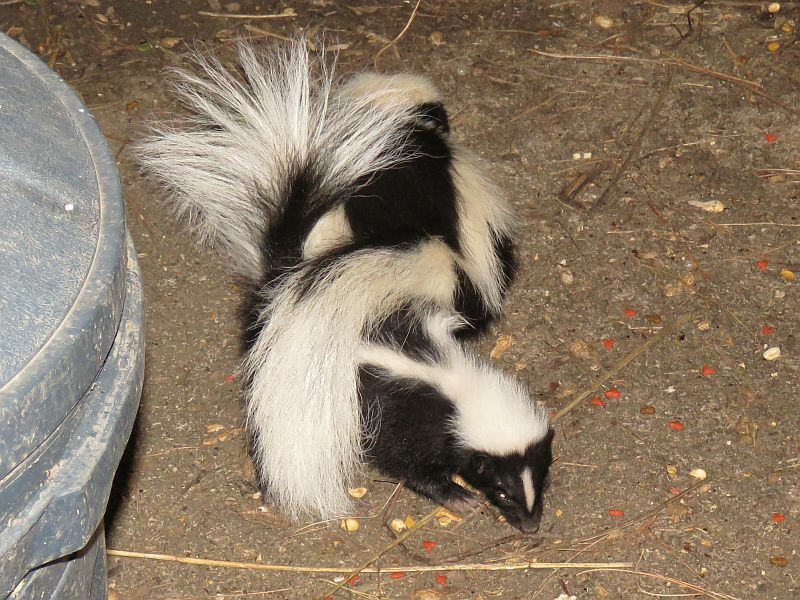 Skunks are frequent nocturnal visitors (rarely during the day). 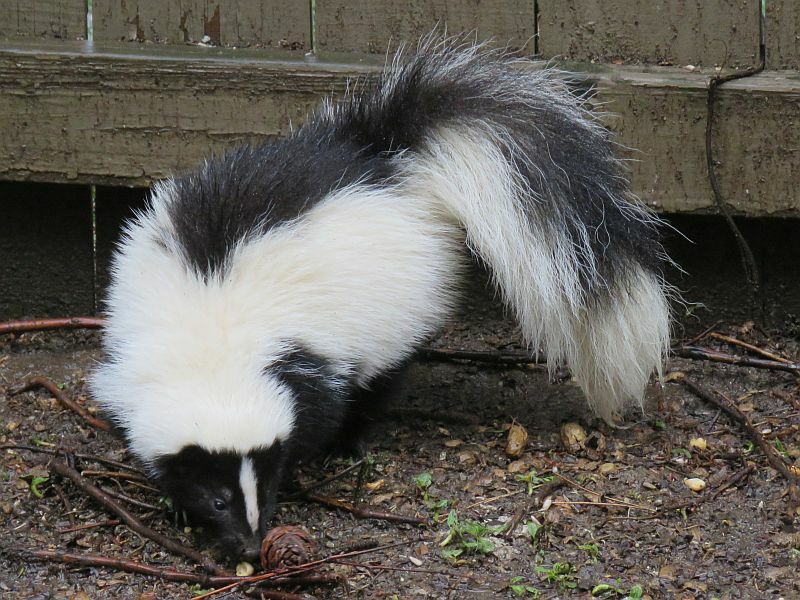 You can tell individuals by differences in their white stripes and spotted patches of fur. 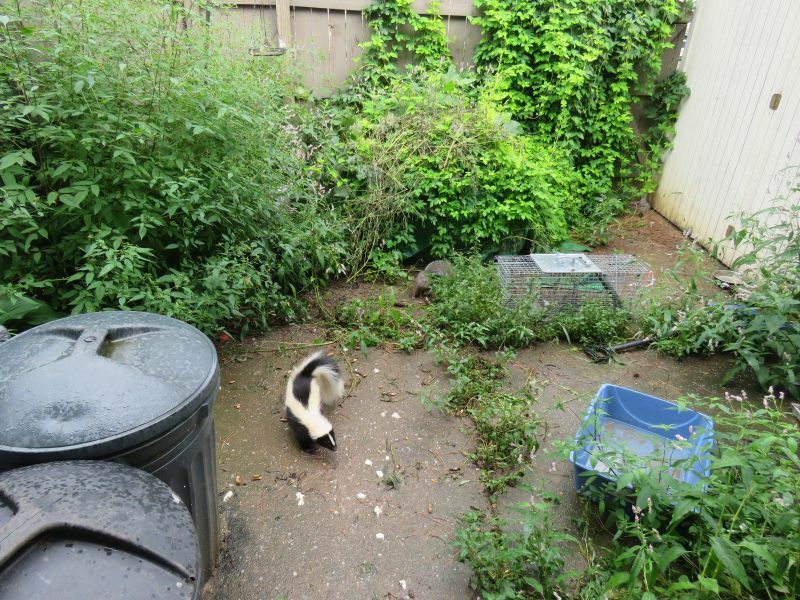 A funny habit when 2 Skunks are eating near each other is for them to push against each other with their tails raised. These 2 are most likely siblings from a litter. There’s a rare Opossum that also visits at night, but I didn’t get a good picture of it, darn it. 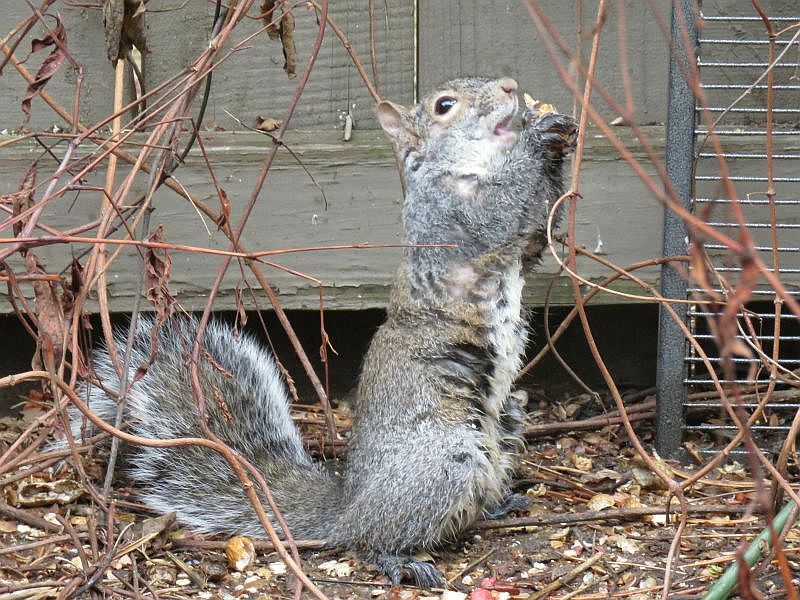 Never forget the Eastern Gray Squirrel! Several visit the patio looking for peanuts. This is Notch- called that because of the notch in his left ear. This is Half Tail. Not sure what happened there! 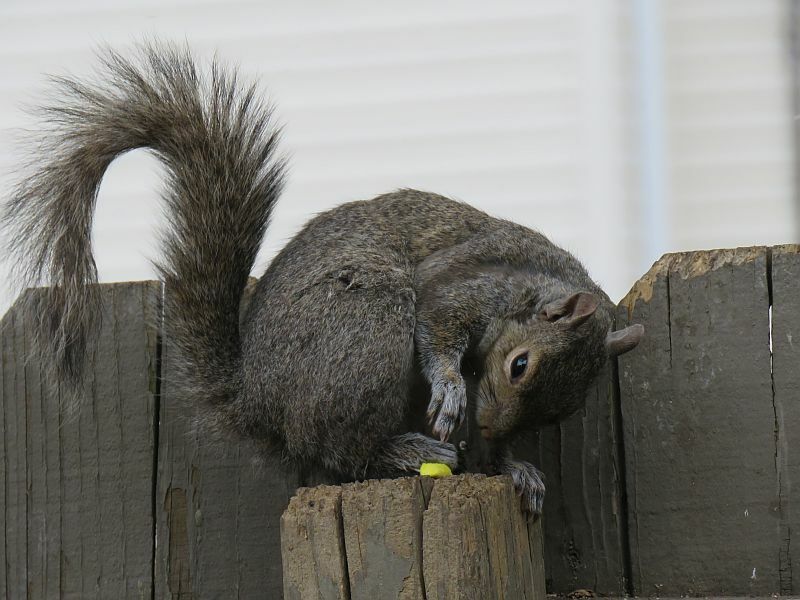 This fellow got something yellow stuck to a foot- hilarity ensued before it came off! Have something else for me? This guy had some kind of issue- he’d eat while holding his food up high. Not sure what that was about. Ahh, youth. 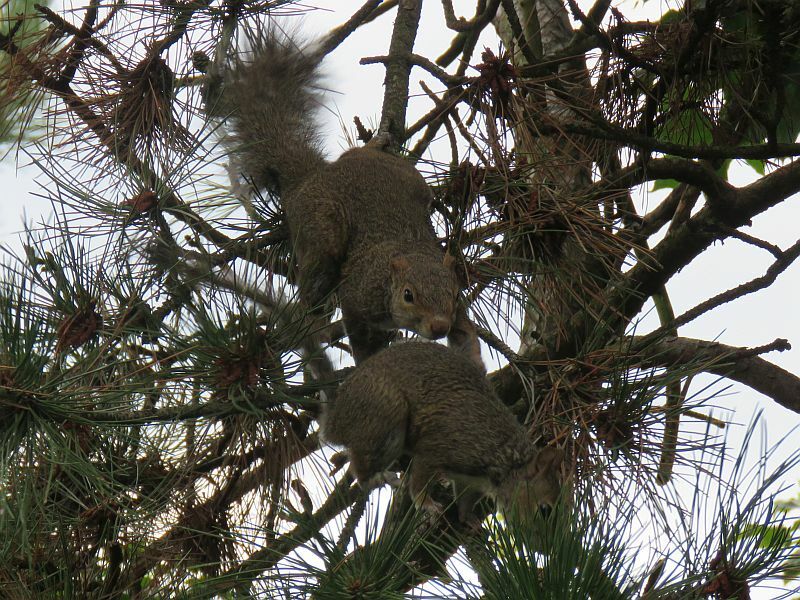 One Squirrel chasing another through the trees. It’s time for this little one to go off on its own- mom is done with feeding him/her. 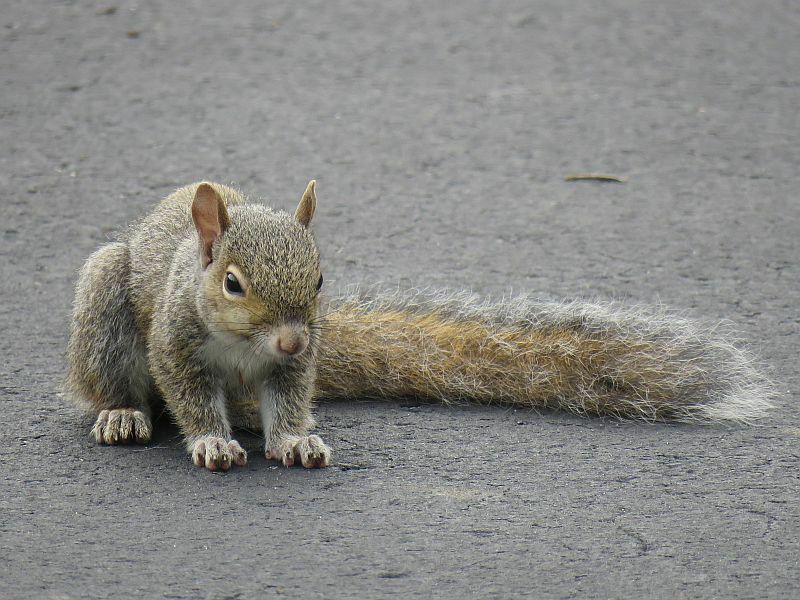 It’s sad to watch the little squirrel follow mom- they just don’t understand what’s going on. 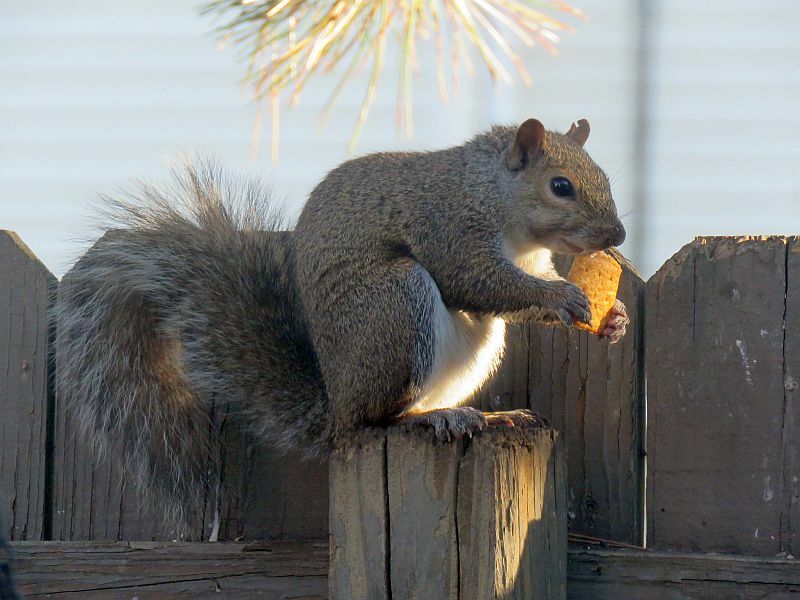 The young one eventually figured things out and is on the patio eating like the others. We all have to grow up sooner or later. Perhaps the most unique visitor above the patio last year was a tree-trimmer. Hope you enjoyed the year in review! ← Two Rare Birds in Ohio, October 2018.
Who knew all that traffic was just outside your window! Loved the descriptions! Thanks, Cheryl- nature is never boring! An excellent record. 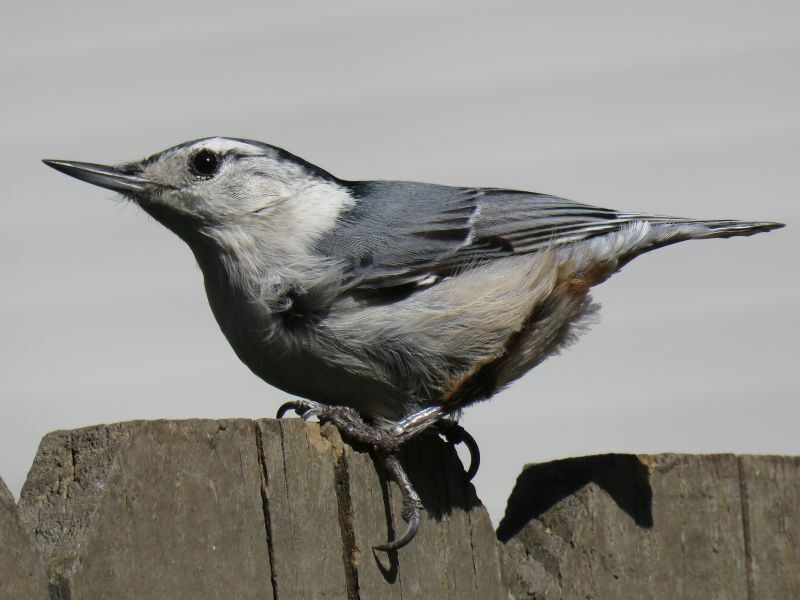 The pictures of the nuthatches were my favourites. 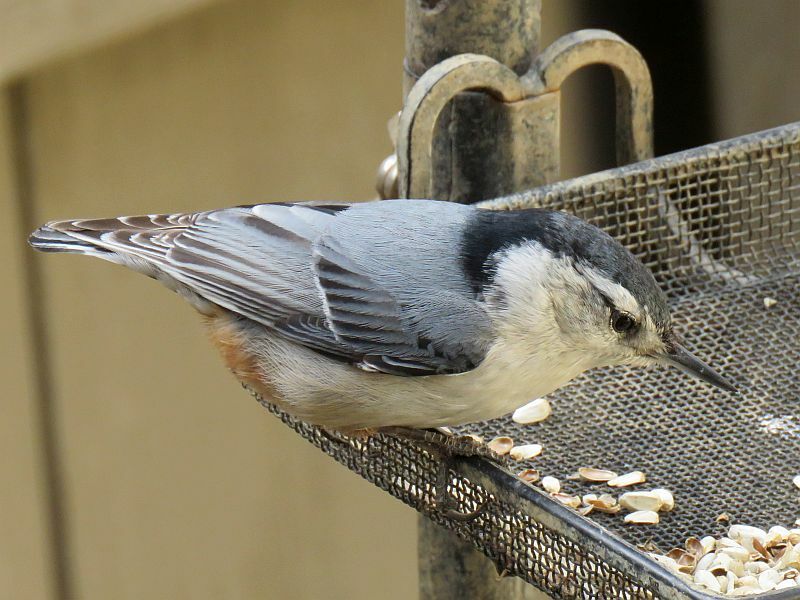 A Nuthatch was on the patio today, Tootlepedal! What a great review! I thoroughly enjoyed your photos! Thanks Montucky- it’s not Montana, but the patio is worth keeping an eye on! 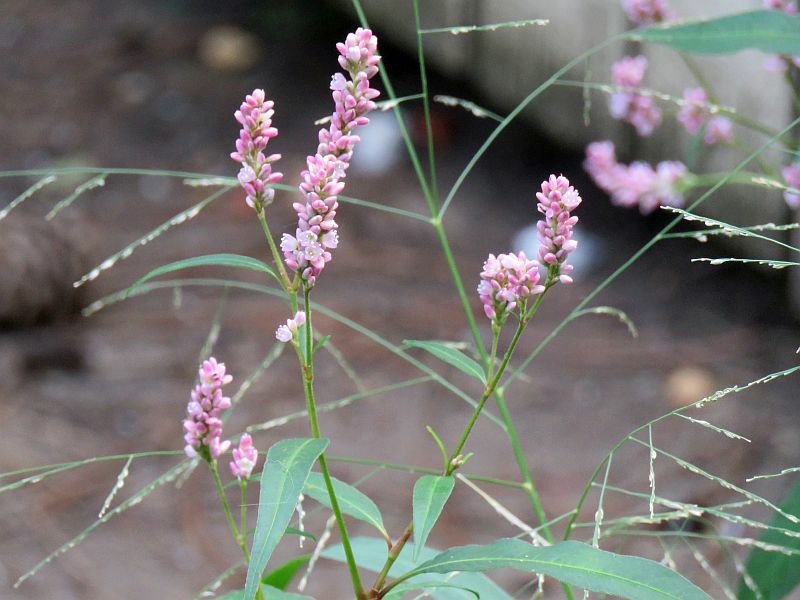 Truly nature at your doorstep, thanks for sharing! Love the photos! And loved the Cleveland cemetery pics, too. My daughter used to live across the street from that cemetery and walked there often. We came up with our older dog and had a lovely stroll through there once ourselves. Garfield Monument is so impressive!